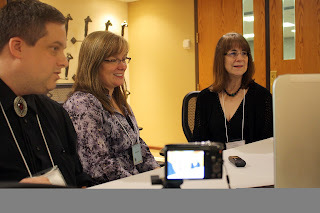 The Writers' Lens: Interview with Christina Katz from the 2012 MWG Conference! Interview with Christina Katz from the 2012 MWG Conference! St. Louis Writers Guild, the Missouri Writers Guild, and The Writers’ Lens continue to bring you interviews from the 2012 Missouri Writers Guild Conference. Today we present Christina Katz, the keynote speakers at the Show-Me Awards Banquet! Christina Katz talks about Platform and more! The interviews were conducted by Brad R. Cook, T.W. Fendley, and David Alan Lucas II. They were made possible by a collaboration between St. Louis Writers Guild, the Missouri Writers Guild, and The Writers’ Lens. Many thanks to Tricia Sanders, the 2012 Conference Chair, and Deborah Marshall, President of Missouri Writers Guild in 2011-2012. Thank you as well to all the speakers who participated. Another great interview! Thanks everyone.